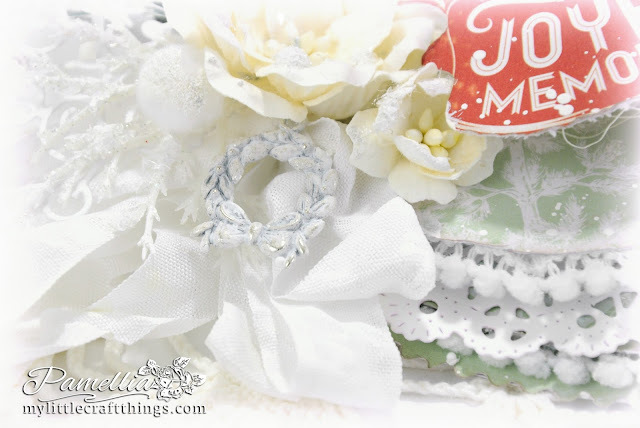 The papers are from My Minds Eye, the snowflake is Cheery Lynn, the pine sprigs were done with a Cheery Lynn die, the doily die underneath is also Cheery Lynn. The snowflake flourish is from Memory Box, the flowers are from Wild Orchid Crafts. The wood reindeer is from DeSerres and I covered it with styrofoam balls that I pulled out of an old stuffed animal, and chunky crystal glitter is dusted on top (although it's hard to see). Exciting news, Sunday night we got a wee bit of snow, so Monday morning I finally walked back out to The Shire. I went and visited Bon Jovi, spent a few minutes being sad and then I turned my camera to happier things. I stayed out for four hours, until every last bit of snow had melted away!!! My posts for this week are already written, so for now, more autumn photos. Next week I will be excited to share more recent pics. For my landscape photo, a shot of the sun rising from behind the tall reeds. For my bird photos today, I have this sweet little Chickadee. and this very wet Grackle. 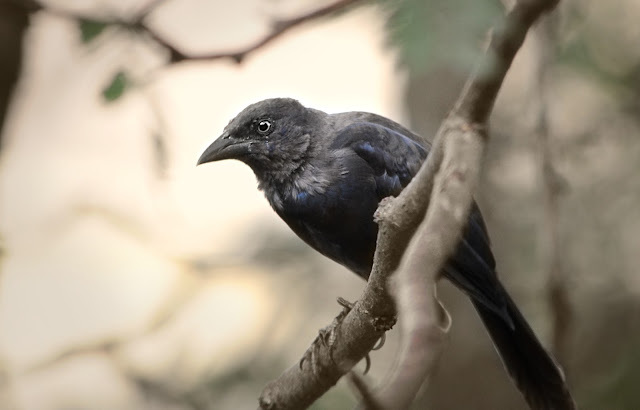 The Grackles have since moved on to their winter homes, so I guess this will be the last shot until spring time. "OK, enough with the leaves. I'm very tiny you know, and I can't see where I'm going!" "OMG, that did NOT just happen! 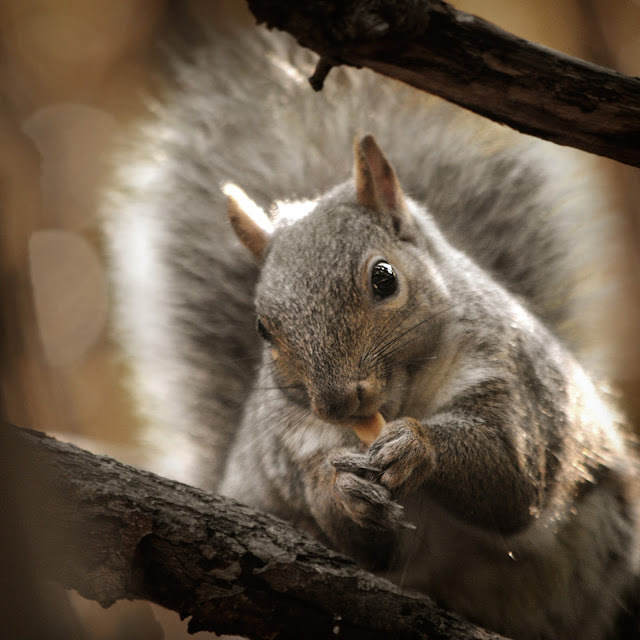 He took my peanut and ran up the tree!" "Is it necessary that you watch me while I'm eating, seriously!" "Aww shucks, thanks Ma'am. Oh, it's all natural beauty, I swear!" Last but not least, my macro for the day. We had a wee frost, not much, but I took full advantage! Hi there Pamellia, your shots of your little friends are fabulous, I adore Henry, and the birds are wonderful, don't think we have them in the UK. A wonderful shape for a card with so many amazing layers and additions. 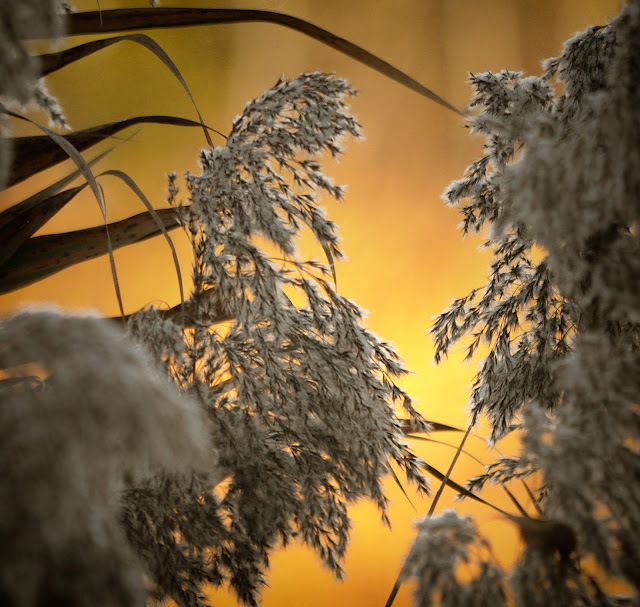 Can that sunrise shot between those seed laden reeds be any more beautiful? I think not! GORGEOUS! Love the stripes on that sweet chickadee's wing. 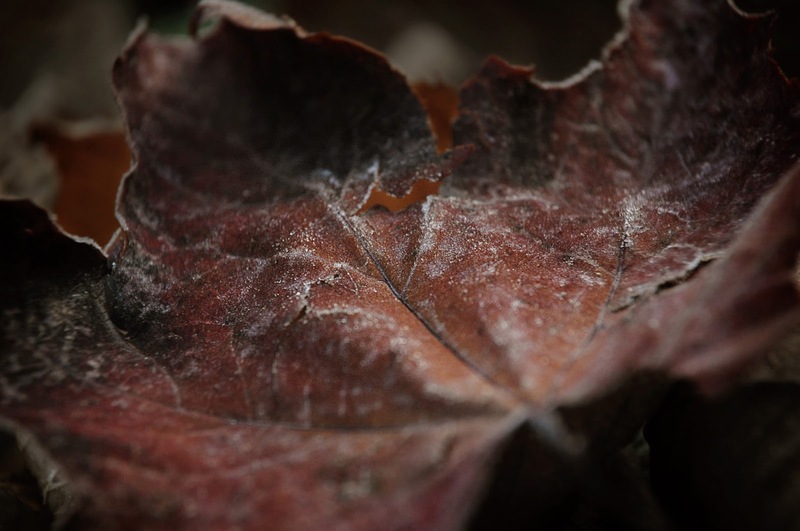 Your frosty macro shot looks almost like tapestry, doesn't it? 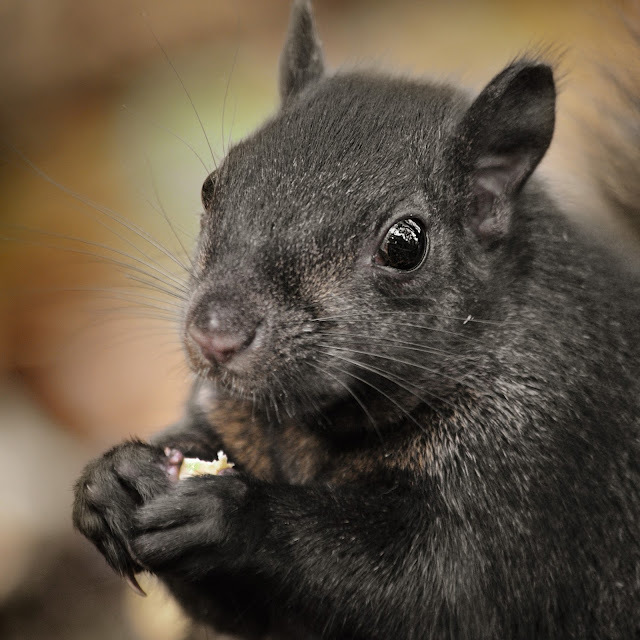 It always amazes me that there is such color diversity in your squirrels. I've tried to be more cognizant of the squirrels here. 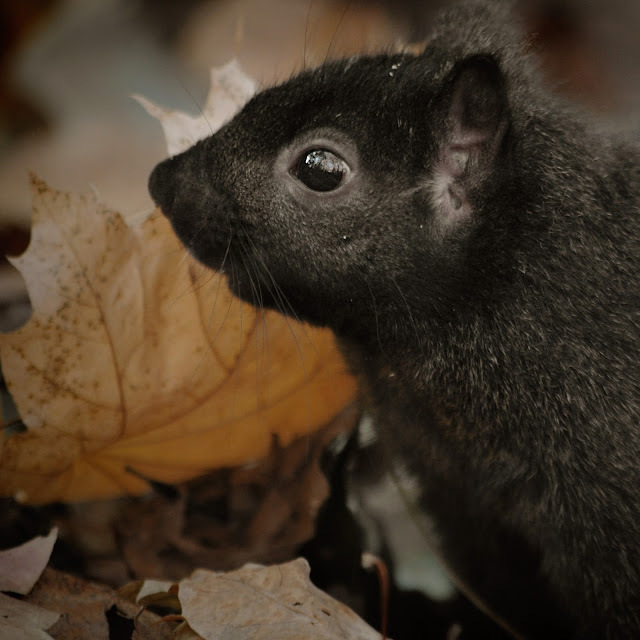 Only the fox tail squirrels seem to have any great variation from the little gray guys in our neck of the woods! So happy for you (proud of you) for getting to the Shire. It's been a couple days now that I have not used the walker, so I put it away! YAYYYY! I hate it, but then, it's better than a wheelchair or no legs, right? Slowly but surely, a little better. 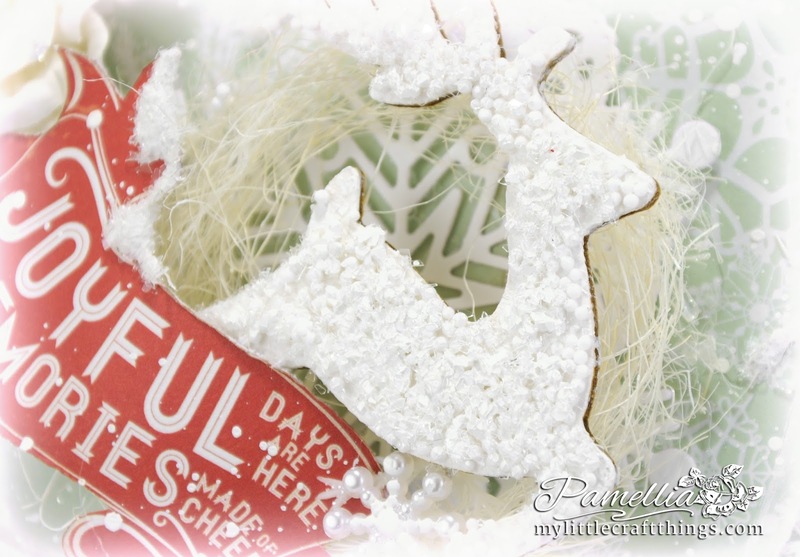 Love your ornament card filled with snowy goodness! Your furry friends photos are always so precious! Another fabulous ornament card, awesome work!! Love very much how you recycled the styrofoam balls to put them on the reindeer, such a clever idea and you have achieved an amazing texture!! Fabulous snow feel and the little pom pom lace all around makes me blow up!! I'm VERY VERY HAPPY that you have come back to The Shire!!! :D Yay!! Hope that all the animals have said a joyful "Hallo" to you, sweet lady, and also that they are all well. Hope that you have enjoyed your day, too! 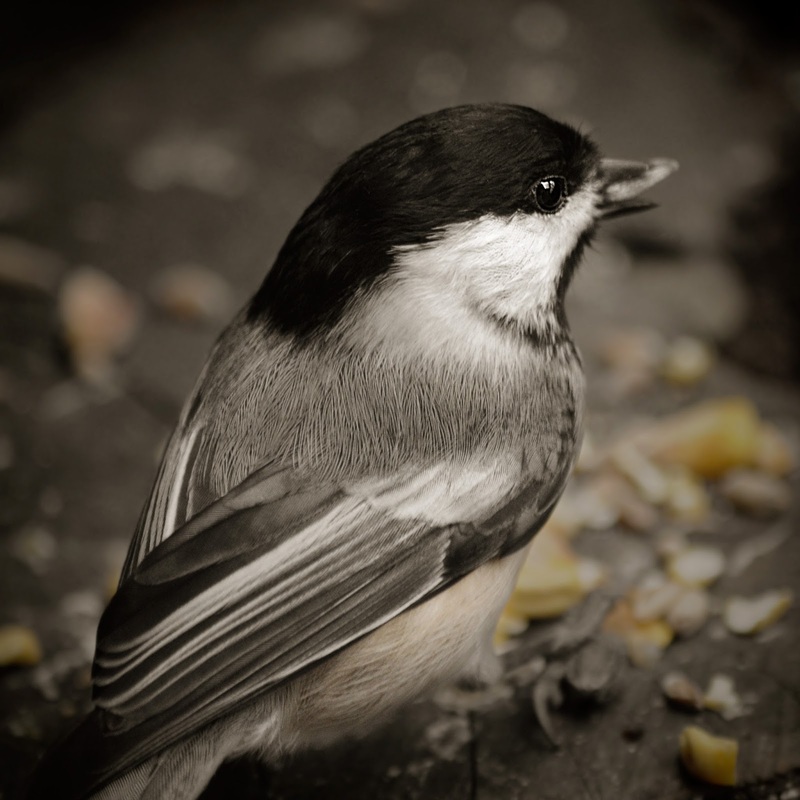 Love so much the daily photos, how cute are the chickadee and all the squirrels! These photos are amazing and I smile very much reading "their" words, how fun! 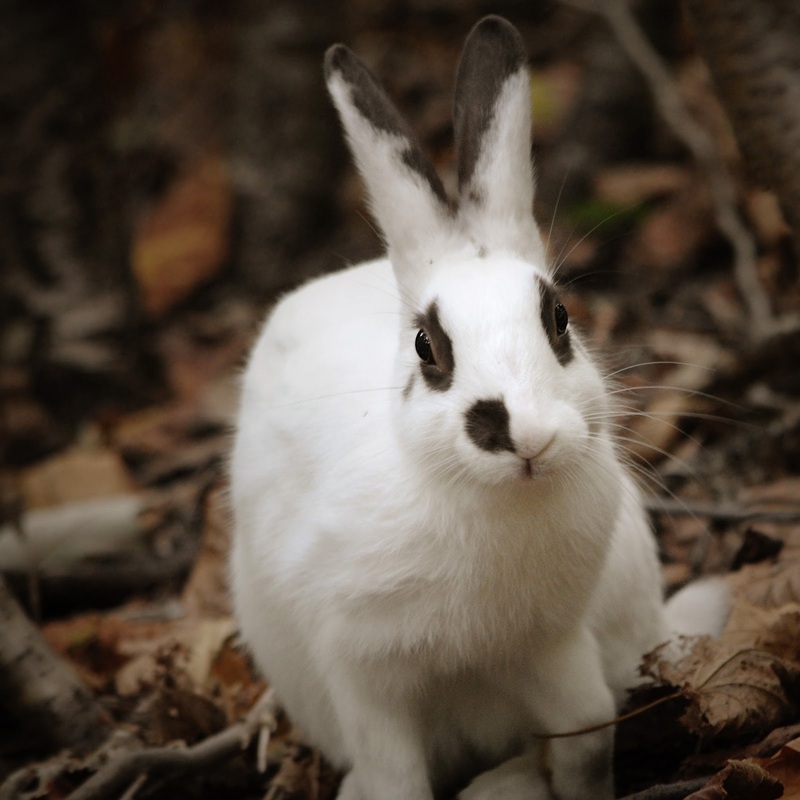 Henri is a true beauty with that black & white nose! And how sweet! Stunning shot of the morning sunrising, too, how magic it is! what a very goreous shaped card and it's very stunning. I love everything you have done to create this. Super photos as usual and wonderful comments. So lovely! Beautiful design, love the shape and the textured reindeer (great recycling)! Enjoyed my 'fix' of your fab photos too...thanks! A beautiful ornament card and as usual so many details on such a small space. I absolutely could not love the ornament card more, Pamellia!! It's so, so stunning!! It could totally be a home decor piece!! The pom trim is beautiful!! I love the texture and the gorgeous reindeer!! You always add the perfect details!! This is spectacular my friend!! It's a card and gift in one!! The shape is wonderful, I really love how you used styrofoam balls to cover the deer, such a great idea! 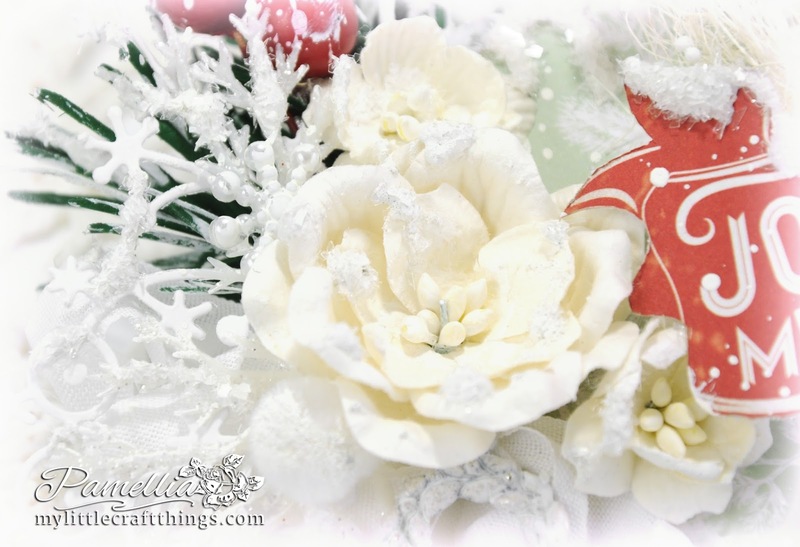 The pom pom edging looks beautiful and the flower and greenery edging look amazing with their snowy topping. A truly stunning card. Such a wonderful ornament card, full of your gorgeous details and beautiful texture. A stunning set of photo's yet again capturing the essence of nature. Gorgeous ornament shape card Pamellia, love how you get so much decoration on this but looks amazing, love the paper colour with pops of red. Glad you ventured to the shire, must have been wonderful with the snow. 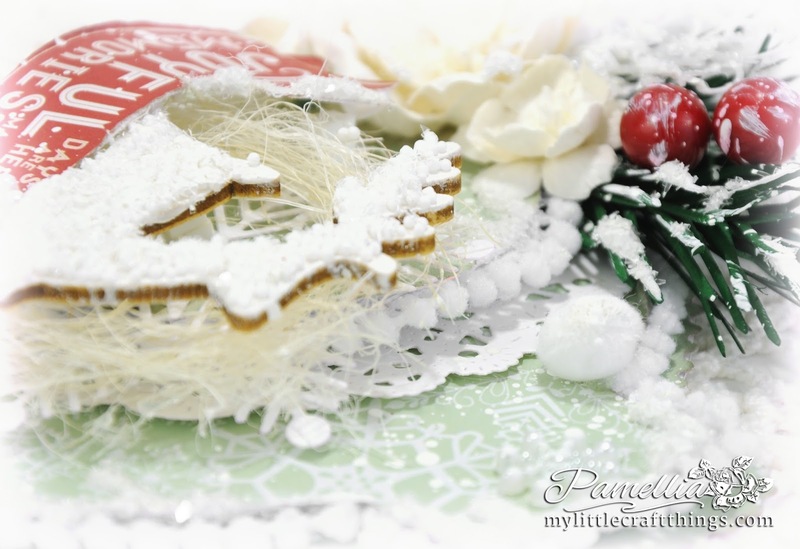 A gorgeous snow ornament card. I am so pleased you were able to return to a walk in the shire. It will get better as the days pass. Wonderful photos those little furry friends are so cute to see and seem to pose for their photos now. Love your photos, as ever!! 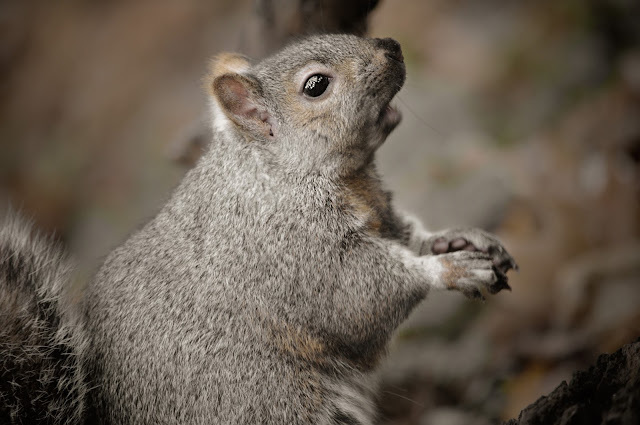 The final squirrel photo is fabulous!!! Woooooow, Pamellia, I am drooling over this frosty stunner! I absolutely adore every single detail but that wooden deer covered with styrofoam balls is spectacular! I am going to steal your genius idea! Ooooh, I could look at your exquisite Christmas ornament card for hours, my friend! Dear Pamellia, I owe you a great apology for not visiting. I am weird, I admit, but I don't like to rush through your posts. I love to soak up all the beauty of your lovely makes, and really take a walk through them, if that makes sense. Since my computer time has been so hit and miss lately, I was just saving a visit for when I knew I had at least 1/2 hour to sit down and really pour over at least one post. Boy, my day is off to a great start by making that visit today! 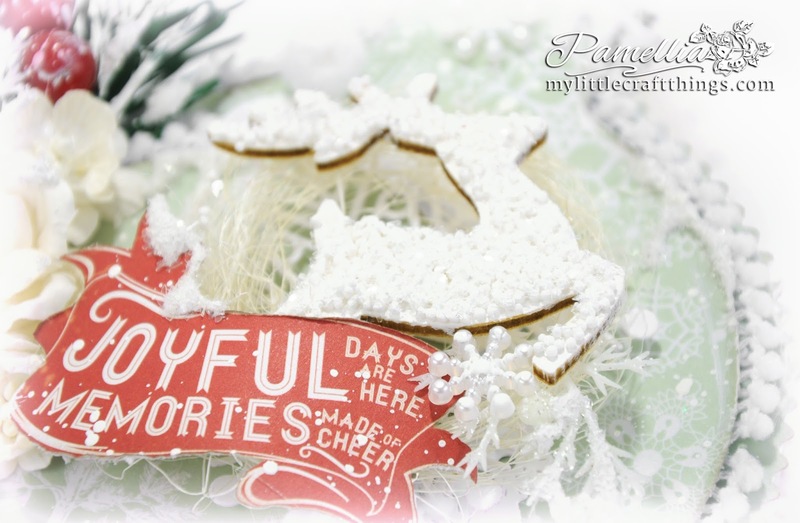 Your ornament card is so luscious and and really makes me yearn for a snowy day! Look at all those lovely layers lined with pom poms that remind me of little snow balls! Squeal! And your pine spray is gorgeous--I dream of your pine sprays-REALLY!! I still remember the first time I saw one on your winter cards; I was in crafty love! The little beads on the deer! Seriously, this looks like a frosted cookie which would be real tasty right now with my coffee! I can just picture you with a scalpel and your worn out stuffed animal getting those balls out! What a mess! But oh, so worth it! Your 'snow' looks soooo real- OMG !!! I will be right over to pick this up! Ha! Ha! Ha! Love, LOVE, LOOOOOVE this ornament card from top to bottom, and I can only imagine how fun it was to create! Your photos are the icing on the cake! A dreamy morning shot and of course, love all those animals and their captions! Your macro shot of the frosted leaf is amazing! Your talents are unlimited, my friend! And I'm so sad my visit has to end here, but I'll be back, I promise! Sending you the warmest hugs! Joyful days are certainly here, when I visit, such a treat with the beauty of your cards and your photographs. 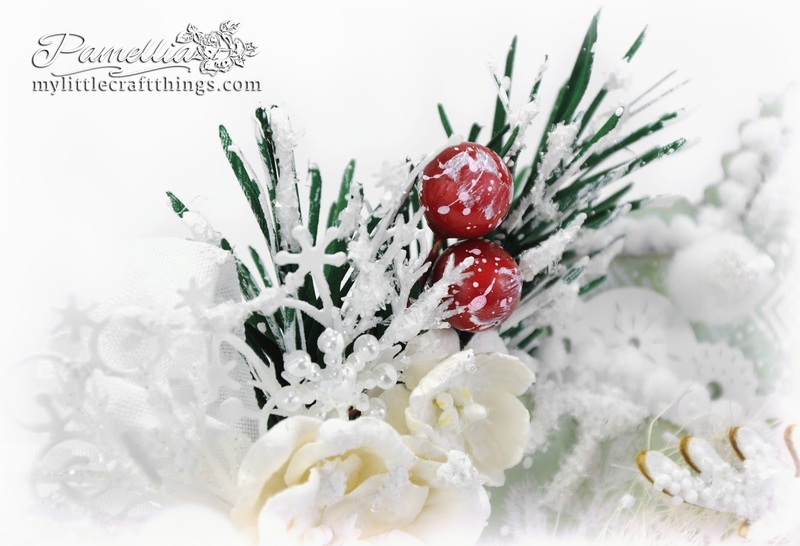 Really gorgeous snow-encrusted bauble, and I love the pop of the red banner against the minty green - fabulous! A treat to be able to see some of your wonderful nature photos again, and I've just been admiring your fab card over at Pion too! Your bauble card is exquisite. I love every single little detail on it. Perfection at it's best. Hugs Mrs A.
I just love your ornament cards, it is not just the shape but you decorate them so beautifully, just look at all of that texture and all of the layering. Totally stunning and a joy to behold. I visit to your blog always makes my day. Wonderful nature shots, those reeds look amazing and all of your sweet, cuddly friends are so adorable. I am pleased you managed to go back to The Shire, it took a lot of courage. I am looking forward to your photos of the snow. Wow! It's better than a real bauble. Just glorious in every detail. So glad you made it back to The Shire. 4 hours in the snow though. Gosh you must have been freezing. Hope you were wrapped up warm. A gorgeous bauble card which is packed with so many fabulous festive details and I love the soft muted tones against the pop of red. Gorgeous! I LOVE the texture on the deer...awesome! Hi there! I haven't visited in a while and what a treat! Your ornament card is so amazing - I love every single detail! So impressed that you upcycled from an old toy!!! Your pictures are also beautiful and it looks like you live in a magical place!